or write to 23, Amherst Avenue, London W13 8NQ. please write to Eileen Eden, membership secretary, 113 Hicks Avenue, Greenford, Middlesex UB6 8HB. Subscription rates : £15 for Membership, £30 to become a Patron and £60 to become a Sponsor. Our address is Perivale Lane, Perivale, Middlesex, UB6 8SS. We are close to Western Avenue (A40), near the Hoover building, but on the opposite side of the road. 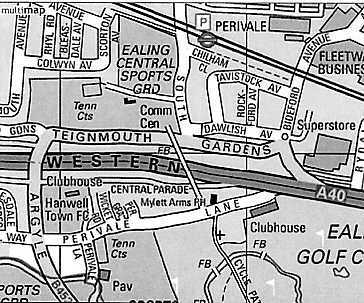 The church is situated at the end of Perivale Lane, off Argyle Road, on the right hand side of the road, opposite the Mylett Arms, about 70 yards down a cycle path (see map - the church is marked with a cross). There is ample free parking on Perivale Lane, and virtually no parking restrictions. The church is a 10 minute walk from Perivale tube station (on the Central line), via a footbridge over Western Avenue. Bus routes to the church include number 95 (along Western Avenue), and 297 and E5 (along Argyle Road).